We’d love your help. Let us know what’s wrong with this preview of The Greens Cookbook by Deborah Madison. "The Greens Cookbook" is that rarity, a book that truly represents a revolution in cooking. Here are the recipes that helped to create the boldly original and highly successful Greens Restaurant on San Francisco Bay. Not only for vegetarians, this book caters to everyone who seeks delight in cooking and eating. 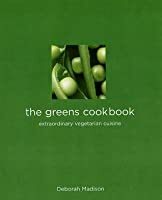 Using an extraordinary range of fresh ingredients in imaginati "The Greens Cookbook" is that rarity, a book that truly represents a revolution in cooking. Here are the recipes that helped to create the boldly original and highly successful Greens Restaurant on San Francisco Bay. Not only for vegetarians, this book caters to everyone who seeks delight in cooking and eating. Using an extraordinary range of fresh ingredients in imaginative and delicious ways, it shows how to present a feast for the eyes as well as for the palate. "The Greens Cookbook" contains more than 260 recipes for all seasons, all occasions, all tastes. From bright, simple salads to beautifully spiralled roulades, here is a provocative, sophisticated and varied fare, dedicated to elegance and balance, taste and texture, color and freshness. To ask other readers questions about The Greens Cookbook, please sign up. I have this book and love it. Many friends recommend Deborah Madison's Vegetarian Cooking for Everyone. If you've used both, how would you compare them? one of 3 cookbooks i am always referring to, working from. the others are alice waters' "the art of simple food" and marcella hazan's "the essentials of italian cooking", which is falling apart. "greens" requires the most ingredients, most chopping, most work, but the results are always spot-on and deliriously good. Love the Pumpkin Bean Soup! Recipes that I like from this book: Pizza with escarole, Fontina and walnuts; spinach noodle pudding; semolina pudding with blood orange syrup. This edition of The Greens Cook Book is out of print. There is a newer edition, but I have not seen it so cannot compare the two. Years ago, maybe around 1999 or 2000, I had the most amazing soup at a Portland restaurant that specialized in breakfast and lunch. I mentioned how much I loved it to the waiter who said it came right out The Greens Cook Book. 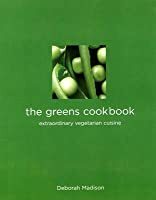 Money was tight so I went to Barnes & Noble, picked up the cookbook and copied out the recipe, intending to buy it later, but later never c This edition of The Greens Cook Book is out of print. There is a newer edition, but I have not seen it so cannot compare the two. Years ago, maybe around 1999 or 2000, I had the most amazing soup at a Portland restaurant that specialized in breakfast and lunch. I mentioned how much I loved it to the waiter who said it came right out The Greens Cook Book. Money was tight so I went to Barnes & Noble, picked up the cookbook and copied out the recipe, intending to buy it later, but later never came. Recently, one of my reviews at Powells.com was used in their email newsletter and they gave me a $40 credit as a thank you. I dithered about what to get, but finally decided I was finally going to get this cookbook for once and for all. And now, after all this time, the used copy was only five dollars. Nonetheless, at that ridiculously low price, it still more than 260 recipes that are still tested in the toughest trial there is, a restaurant kitchen. I need to purchase this one. It’s for people who embrace vegetables and love flavor, vegetarian or not. I've only eaten at the Greens restaurant once. The food was good, but I think because I already had the cookbook, I was expecting more. Not sure why exactly because this is one of those books that, while it's quite good, feels a bit old-fashioned... maybe because of the more traditional French feel. I guess that's why the food wasn't brilliantly memorable. I do still use the cookbook though. There's a lovely fresh and bright tasting Potato-Sorrel Soup that continues to be one of my favorites. I should preface this review by stating that my husband and I love the Greens restaurant and go there every time we are in San Francisco. This is a great cookbook that should be a part of any vegetarian or vegan library. The recipes are generally not fast or easy (some ingredients are difficult to get, depending on where you live) so I wouldn't suggest it for beginning or busy cooks. However, these recipes make the most out of wholesome ingredients and are delightful to serve (and eat!). I love this book! Although it has no photographs, the recipes are wonderful. Some great ideas and fresh takes on veggie meals. Some of the recipes have a lot of ingredients but I think its worth doing by the book! This is my absolute favorite cookbook. The recipes are not too labor intensive, but they are more work than my typical weeknight dinner fare. 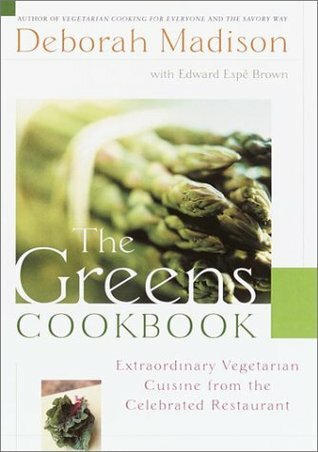 I like cooking from this book so much that we eat vegetarian many times a week as a result. I've had this since the early nineties and use it a LOT. Although not a vegetarian, I do eat a lot of meatless meals, and whether I follow a recipe religiously or not, she provides a lot of great jumping off points! Exceptional flavors and flavor combinations: not watered down for cookbookland. The recipes are a bit complex, but you can substitute a little here and there and still have amazing results. Red wine and red onion soup is a staple for me. The book opens to it now when I set it down. If you have ever eaten at Greens, you know why this is a must-have cookbook. The Greens Cookbook has unbelievably yummy gourmet veggie recipes on every page. We use lots of these recipes for entertaining and special occasions. No pictures and somewhat complicated recipes. Not the greatest to me. Fabulous veggie recipes even if you aren't a vegan. Some amazing pizza recipes in here, believe it or not. Though sometimes fussier than I like to cook, these are all delicious, memorable recipes. I am going to buy a copy of this one; Madison has a lot of recipes for different seasons that could be made over a slow period of time, and her food is always delicious. Nothing in this book can be made for under $30. Still, yum. It is a treasure house of wonderful recipes!!! A friend gave this book to me over 20 years ago. I have enjoyed the recipes over the years. B Some good interesting recipes; I want to eat here! This vegetarian cookbook can stand right alongside "Sundays at Moosewood" and "Moosewood Cooks at Home." It is a different style of vegetarian cooking, but equally good. Deborah Madison is an American chef, writer and cooking teacher. She has been called an expert on vegetarian cooking and her gourmet repertoire showcases fresh garden produce. Her work also highlights Slow Food, local foods and farmers' markets.